Phoenix Veterinary Center is passionate about providing the best healthcare for your Pets. Along with proper nutrition, exercise, and preventive care, healthy teeth also play a vital role in the overall health of your dog or cat. 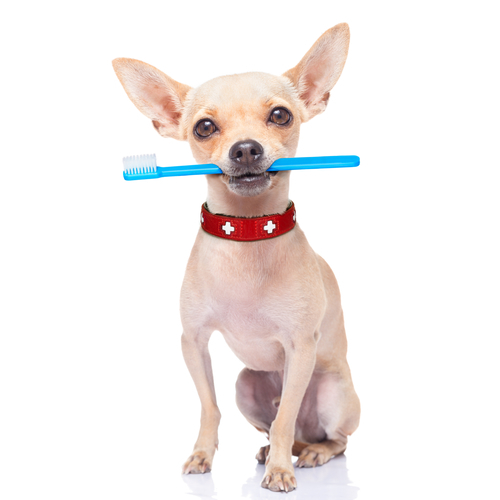 Just like humans, our pets can acquire gum disease and other oral problems including tooth decay. Poor oral hygiene can extend beyond their mouth, and if left untreated the toxins from periodontal disease can absorb into the bloodstream and affect kidneys, liver and at times fatal organ damage. Now that we’ve painted the worst possible scenarios about your Pets teeth, the good news is that it’s preventable. At Phoenix Veterinary Center we believe that preventive care for your dog and cats teeth is the best medicine. When Fido or Miss Kittie's breath takes a turn for the worst, it’s could be an indicator that they are having oral issues. At Phoenix Veterinary Center we can provide a thorough examination of their mouth which will help determine if a dog or cat teeth cleaning is necessary. It will also provide us with an opportunity to discuss how to help prevent periodontal disease. If we find that tooth extraction is necessary, Dr. Baldwin is skilled in oral surgery including complicated tooth extractions and flap procedures to prevent open sockets. What are the symptoms of Dental disease in your dog? As with every aspect of caring for a four-legged family member, it’s up to us to pay attention to changes in their eating habits. After all, we are their voice, and unlike your pet, as humans we of course have the advantage of being able to speak up when we have a toothache. If your dog has one or more of the issues listed below, it’s time to schedule an appointment and see if your furry family member needs a dental cleaning or possibly even an extraction. Of course, we always recommend dog teeth cleaning to avoid issues down the road, and an annual checkup can uncover oral matters before they become painful for your companion. Unlike dogs, when Miss Kitty has a toothache, she may not show visible signs of discomfort until she is in considerable pain. Cats often hide their pain, and they are more likely to bite so paying attention to changes in their behavior is key. Contacting Phoenix Veterinary Center with your concerns about changes that you notice is the best weapon that you have to keep Miss Kitty out of pain. Of course, we always recommend cat dental care before issues arise and an annual checkup to uncover dental problems before they become painful for your companion. At Phoenix Veterinary Care we strive to provide complete care for our patients. From pet dental care that’s second to none to preventive physical exams, pet education, internal medicine and comprehensive laboratory testing and diagnostics our animal patients are treated with love, care, and compassion. To learn more about Dog & Cat Teeth Cleaning & Dental Care contact Phoenix Veterinary Center to make an appointment for your Pet or call (602)559-5500 today!